I have spent the past week hauling freshly-drawn milk in buckets hanging from a belt around my waist. I’ve been picking poke salad and gathering pecans. I’ve been walking to school, barefoot, bruising my feet and losing toenails along the way. And in the past seven days, I spent nine days in the back of a pick up on Route 66, on a mattress with my three siblings, protected from the sun by an awning stretched from one side-board to the other. The nights were spent camping alongside the roadway. California, here we come! All of this really did happen, but I wasn’t there and it wasn’t this week. 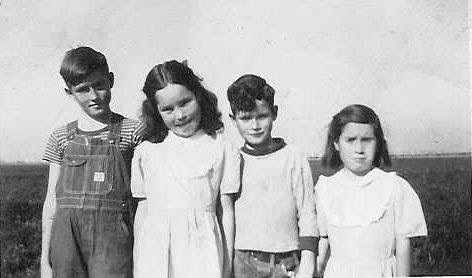 I have been in a type of Harris Family Time Machine, thanks to memories shared by my dad and his sisters, Grandma Ruby, and (through hand-written memoirs) generations beyond them. I feel like I’ve been zapped into another world! When I was a young girl, Thursday evening meant it was time to hunker down in a far corner of the house with Mom, a glass of milk, and a few cookies. It was time for Little House on the Prairie and I couldn’t wait to see what trouble Nellie Olson would cause for Half Pint! Little Laura was such a cutie (so was Pa, by the way! ), and their hard life seemed so far away. Almost unimaginable. Funny how now, 40 years later, the life of that era (well, a couple of decades later than that era, to be specific) seems almost in reach. As I research and gather the history of my own family, it sometimes feels like being in the middle of a good book; I have to walk away from it at times, but I can’t stop wondering, “What happens next?” I want to know more! Hearing a presentation recently about the need to keep the history of the San Joaquin Valley alive, I felt a strong urge to begin a project to keep the history of our family alive, especially with Grandma Ruby’s 96th birthday around the corner. My dad is my partner in crime and we’re having a ball. The memories shared during a recent “remembering session” with my aunts and dad were fascinating, but that was just the beginning! Next came a visit with Grandma, who filled in some blanks, emails from Aunt Ruth in Oregon, then a very special treasure: a collection of writings and letters my dad had tucked away and forgotten…letters between my grandfather Oran, his siblings, and their parents. I’m learning about Papa’s work ethic. He and his brother Eston traveled around Oklahoma and beyond, chasing work and staying in one place as long as the job would allow. I learned how the family came to settle on farm land in Eufaula, OK, where Great Aunt Lillian spent more than half her life lovingly caring for her severely disabled sister, carrying her from place to place as needed. And I have begun to see Grandma Ruby in a different light, as a brave woman who came to California in search of a medical cure for her young daughter, Faye, who was born with a hole in her heart. The research continues, and the well is nowhere near dry yet. But I must set aside the story for now; 2015 is calling and my day-job won’t wait.